We are so excited to share a great news to everyone that Darul Iman Express has now joined BusOnlineTicket.com to provide online booking service for their bus service. We believe that the partnership with Darul Iman Express could enhance our customer experience and give the best possible service to our valued customers. 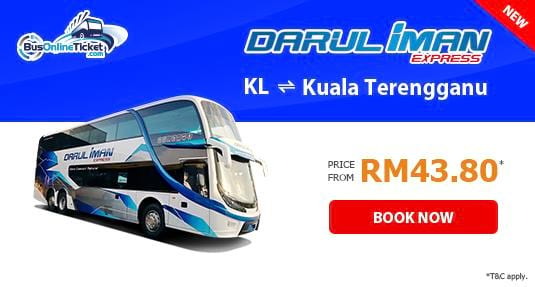 Now, all of our customers can purchase Darul Iman Express bus ticket online at BusOnlineTicket.com anywhere and at anytime with a single click. Darul Iman Express is a relatively new bus company based in Terengganu which provides their passengers with an excellent service and earning customers’ satisfaction. The buses deployed by Darul Iman Express are equipped with Wi-Fi connection, USB ports, air-conditioner and spacious legroom. With these facilities on board, passengers can enjoy a pleasant bus journey when travelling with Darul Iman Express. The bus services offered by Darul Iman Express mostly depart from Kuala Terengganu to different locations within Peninsular Malaysia. The popular bus routes offered by Darul Iman Express include bus from Kuala Lumpur to Kuala Terengganu and bus from Kuala Terengganu to Kuala Lumpur. The bus fare is reasonably priced from RM 43.80 for return trip. You can sign up and log in to your account to make your Darul Iman Express bus ticket booking from our official website BusOnlineTicket.com or through our mobile app to earn BOT Miles. BusOnlineTicket.com mobile app can be downloaded for free on App Store or Google Play. Confirmation of ticket is instant in BusOnlineTicket.com.